The secret to our Legendary Cultivation is our respect for the growing process as a perpetual cycle. We believe that the many symbiotic relationships within a healthy ecosystem create our renewed, naturally rich growing conditions. Move your mouse over our methods circle to learn more. Through our own breeding program, and in cooperation with other skilled breeders, we continue to add to our diverse inventory of genetics. We pride ourselves on our ability to select, develop, and care for strains of cannabis that both flourish in our local ecosystem, and provide for a constantly evolving menu available to our customers, including some of the most important and steadfast “classics,” as well as innovative and daring newcomers. Our team’s combined life journeys encompass decades of varied involvement with cannabis, and we have been fortunate to curate a unique and diverse collection of very special cannabis cultivars. Our custom living soil recipe has been continually evolving through years of real world practice and experimentation. Our soil is forever improving with the passing of time, as every discarded part of the plant is returned to the soil for regeneration. 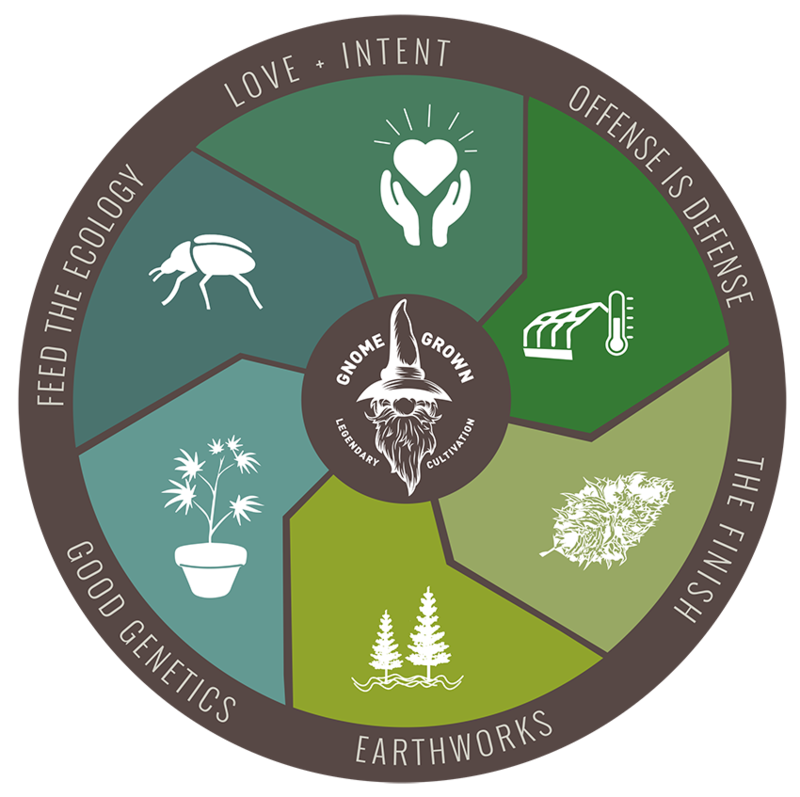 Wildcrafting also serves as an integral piece of our regenerative mission. We ferment and store all of our supplemental plant nutrients, which are directly sourced and gathered from our farm. With a little help from micro and macro biology, we are able to completely eliminate the need for bottled nutrients. This careful construction of our closed-loop system fuels the vigorous growth of our plants and forms one of the pillars of our “Legendary Cultivation” moniker. Large or small, each and every plant is given individual, daily attention throughout its life cycle. Careful and constant observation is a major component to a plant’s healthy growth. In our commitment to deepen the level of individualized care, we avoid automation in exchange for the hand watering, sculpting, and inspecting of each plant based on its own unique needs. This keeps our team intimately connected with the garden as a whole and creates an endless stream of natural energy interchanging and strengthening the entire ecosystem. This time consuming and often costly process sets us far apart from the majority of automated, high-volume cannabis producers seen today, but in our opinion, it is only with such careful love and intent that superior, finished cannabis is grown. Proper cannabis production requires a mastery of external environmental stimuli. Combined lifetimes of experience have taught us that environmental subtleties are often the difference between peak and marginal plant performance. A deep understanding of the ability to adjust critical factors, such as temperature and humidity, is vital in warding off unhealthy pathogens like molds and mildews. We have significantly invested in customized infrastructure that affords our Master Grower a level of control largely unseen outside of large scale grow operations. Due in part to this infrastructure, pests don’t stand a chance in our ecosystem. We have long-employed beneficial biology to help maintain the careful balance of plant and pest. No pesticides are used in our gardens, not even those deemed “organic.” We strive to set the highest bar for the level of purity in all parts of the growth cycle, including in the building of natural defenses. When the fruits of our farm’s labor are ready, our plants are carefully harvested by hand, and slowly hang dried in a climate-controlled environment. The harvest is then hand-trimmed by experienced staff who truly understand how to bring even more vibrancy to the nearly finished product. Finally, our product is cured to perfection for maximum terpene and cannabinoid preservation. The quality and care in our post-harvest work is as important to our process as the plant growth cycle. Because of this, our finished flower offers a truly exceptional and complete sensory experience, encompassing unsurpassed visual, aromatic, and taste characteristics. One of our early milestones was selecting the best possible piece of land upon which to grow. Our property consists of 30 acres of mixed mature forest, wetlands, fruit orchards, and open meadows fed by a pristine, year-round spring creek originating just a few miles upstream from our draw point. By inheriting such a wonderfully diverse ecosystem we are able to source from a wide range of biomass for creating our unique nutrients and precious living soil, utilized throughout the year-round growing cycles. This biodiversity facilitates our use of a closed-loop growing system in which a plant’s entire life cycle is supported by the ecosystem of the farm. The secret to our Legendary Cultivation is our respect for the growing process as a perpetual cycle. Continuous, living soil fosters optimally nourished cannabis of the finest quality. We honor holistic care for plants, soil, water and compost. We believe that the many symbiotic relationships within a healthy ecosystem create our renewed, naturally rich growing conditions. One of our early milestones was selecting the best possible piece of land upon which to grow. Our property consists of a 30 acre mix of mature forest, wetlands, fruit orchards, and open meadows fed by a pristine, year-round spring creek originating just a few miles upstream from our draw point. By inheriting such a wonderfully diverse ecosystem, we are able to source from a wide range of biomass for creating our unique nutrients and precious living soil, utilized throughout the year-round growing cycles. This biodiversity facilitates our use of a closed-loop growing system in which a plant’s entire life cycle is supported by the ecosystem of the farm. Through our own breeding program and in cooperation with other skilled breeders, we continue to add to our diverse inventory of genetics. We pride ourselves in our ability to select, develop, and care for strains of cannabis that both flourish in our local ecosystem, and provide for a constantly evolving menu available to our customers – including some of the most important and steadfast “classics,” as well as innovative and daring newcomers. Our team’s combined life journeys encompass decades of varied involvement with cannabis and we have been fortunate to curate a unique and diverse collection of very special cannabis cultivars. Our custom living soil recipe has been constantly evolving through years of real world practice and experimentation. Our soil is forever improving with the passing of time, as every discarded part of the plant is returned to the soil for regeneration. Wildcrafting also serves as an integral piece of our regenerative mission. Large or small, each and every plant is given individual, daily attention throughout its life cycle. Careful and constant observation is a major component to a plant’s healthy growth. In our commitment to deepen the level of individualized care, we avoid automation in exchange for the hand watering, sculpting, and inspecting of each plant based on its own unique needs. This keeps our team intimately connected with the garden as a whole and creates an endless stream of natural energy interchanging and strengthening the entire ecosystem. This time consuming and often costly process sets us far apart from the majority of automated, high-volume cannabis producers seen today – but in our opinion, it is only with such careful love and intent that superior, finished cannabis is grown. Proper cannabis production requires a mastery of external environmental stimuli. Combined lifetimes of experience has taught us that environmental subtleties are often the difference between peak and marginal plant performance. A deep understanding of, and the ability to adjust factors such as temperature and humidity are critical in warding off unhealthy pathogens like molds and mildews. We have significantly invested in customized infrastructure that affords our Master Grower a level of control often unseen outside of large scale grow operations and which is necessary to balance our delicate ecosystem. Pests? They don’t stand a chance in our ecosystem. We have long employed beneficial biology to help maintain the careful balance of plant and pest. No pesticides are used in our gardens, not even those deemed “organic.” We strive to set the bar for the highest level of purity in all parts of the growth cycle, including in the building of natural defenses. When the fruits of our farm’s labor are ready, our plants are carefully hand harvested and slowly hang dried in a climate-controlled environment. The harvest is then hand trimmed by an experienced staff that truly understands how to bring even more vibrancy to the nearly finished product. Finally, our product is cured to perfection for maximum terpene and cannabinoid preservation. The quality and care in our post-harvest work is as important to our process as is the plant growth cycle. Because of this, our finished flower offers a truly exceptional and complete sensory experience encompassing unsurpassed visual, aromatic, and taste characteristics.